Figure 6.10 Tympanogram of the same case, type AD according to the classification of Liden-Jerger, 1976 (see text). Figure 6.11 Left ear. Grade II atelectasis with marked epi-tympanic retraction. The tympanic membrane touches the incus. The malleus is medialized. Air-fluid levels are seen in the anteroinferior quadrant. The insertion of a ventilation tube is necessary to restore normal conditions. Figure 6.12 Right ear. Grade II atelectasis. 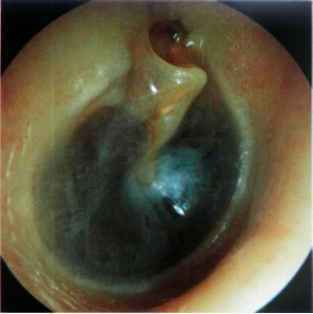 A condition similar to the previous case but with the onset of thickening of the tympanic membrane. Figure 6.14 Left ear. Grade III atelectasis. The tympanic membrane touches the promontory and the incus. An air-fluid level and a tympanosclerotic plaque can be seen in the anterior quadrant. Figure 6.13 Right ear. Grade II atelectasis. The tympanic membrane is very thin due to absence of the fibrous layer. The membrane adheres to the incudostapedial joint and the tensor tympani tendon. Insertion of a ventilation tube is indicated. Figure 6.15 Left ear. Grade III atelectasis. The thin and atrophic tympanic membrane is in contact with the promontory. Middle ear effusion is seen. A tympanosclerotic plaque is present in the anterosuperior quadrant. The head of the malleus is visible through an epitympanic retraction pocket. The insertion of a ventilation tube is indicated. Figure 6.16 Right ear. Adhesive otitis media or grade IV atelectasis associated with a mild epitympanic retraction pocket. 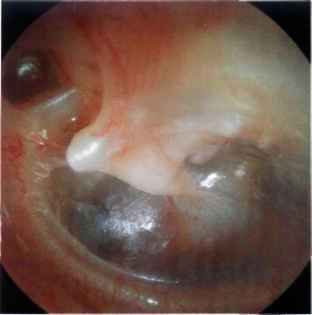 The thin and atrophic tympanic membrane completely covers the promontory. 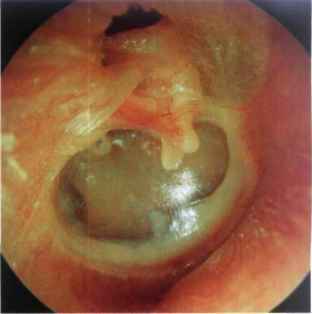 The tympanic membrane retraction has caused erosion of the long process of the incus with a subsequent spontaneous myringostapedopexy As the patient does not complain of hearing loss, surgery is not indicated. Figure 6.17 Left ear. Grade IV atelectasis. The malleus is medialized and adherent to the promontory. The tympanic membrane is atrophic. The epidermal layer of the membrane is adherent to the incudostapedial joint, the promontory, and the round window. A retraction pocket corresponding to the eustachian tube orifice is also seen. Middle ear effusion is present. Insertion of a ventilation tube is indicated. Figure 6.18 Left ear. Adhesive otitis media. 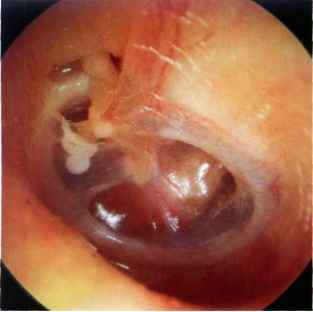 This case represents the long-term sequela of persistent secretory otitis media with chronic eustachian tube dysfunction. The fibrous and mucosal layers of the tympanic membrane were resorbed, whereas the epidermal layer is completely adherent to the medial wall of the middle ear. The promontory, round and oval windows, as well as residues of the ossicular chain are all visible. The handle of the malleus is completely medi-alized and partially eroded. The long process of the incus is eroded, whereas the stapes suprastructure is completely absent. As the patient does not suffer from otorrhea, surgery is not advised. Figure 6.19 Right ear. The thin and atrophic tympanic membrane adheres to the promontory, incudostapedial joint, pyramidal process, and stapedius tendon. The long process of the incus is partially eroded. Calcifications are present in the anterior quadrants. As hearing is normal, surgery is not indicated. mae. 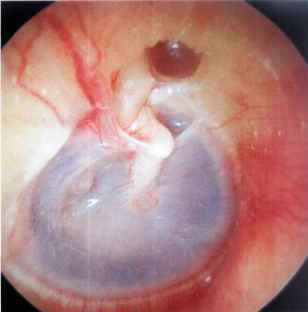 The tympanic membrane is thin and transparent due to absence of the fibrous layer. The handle of the malleus is amputated. The long process of the incus is eroded and a natural myringostapedopexy is noted. The promontory, round window, head of the stapes, and oval window can be seen through the thin tympanic membrane. Despite the attic epithelialization, a true cholesteatoma has not yet formed. Regular follow-up of such cases is fundamental. Should the disease progress with cholesteatoma formation, surgery in the form of an open tympanoplasty is indicated. Figure 6.21 Left ear. Posterior retraction pocket. The tympanic membrane remains adherent to the stapes' head even after Valsalva maneuver (myringostapedopexy). The remaining part of the tympanic membrane is thick and shows tympanosclerosis. 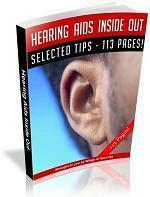 Audiometry revealed normal hearing. Cases with myringostapedopexy generally have good hearing; therefore, surgery is not indicated except if conductive hearing loss develops and/or a posterior retraction pocket is associated with frequent otorrhea. Surgery varies from simple myringoplasty (when the tympanic membrane needs reinforcement) to tympanoplasty (in which the ossicular chain is eroded and needs ossiculoplasty). Figure 6.22 Right ear. The tympanic membrane, being adherent to the long process of the incus, caused erosion of the latter with subsequent conductive hearing loss (see Fig. 6.23). The second portion of the facial nerve is seen superior to the oval window. The head of the stapes and the stapedius tendon are also visible. Tympanoplasty surgery was performed on this patient. 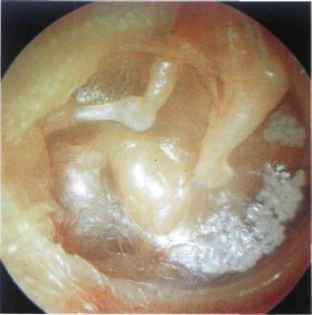 The tympanic membrane was reinforced and the incus interposed between the handle of the malleus and the stapes.